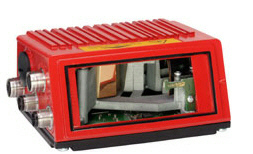 The BCL 500i bar code reader series from Leuze Electronic is not only flexible in application due to its outstanding versatility, but also offers integrated field bus connectivity for fast and simple implementation. The unique webConfig software permits convenient device commissioning. The wide range of different bar code reader variants offered by Leuze electronic guarantees maximum flexibility for a wide range of applications. Users can choose between three lens variants for different modular widths from 0.25 mm through to 1.0 mm. The barcode readers are available with identical scanning fields as line scanners and also in the form of the latest-generation swivel mirror or deflecting mirror versions. The high-performance lens of the BCL 500i features a symmetrical ±30° optical angle of aperture and provides scope for an extensive scanning field aperture with a high depth of field even at close range. Purchase your Leuze BCL 500i & BCL 501i Barcode Readers with Integrated Decoder today!